When a drink that’s supposed to be served ice-cold is poured at room temperature… well, you might as well skip drinking it altogether. Here’s a super quick way to make your drinks (canned or bottled) refreshingly cold — and with stuff you probably already have at home: a bowl, ice, water, and the secret ingredient: salt. Add ice to the water, to fill it up no more than about 3/4 of the way. Sprinkle in some ordinary cheap table salt – about a tablespoon for a big cup, and 1/2 cup for a cooler. The salt will lower the freezing temperature of the water, thereby making it a more effective cooling agent. 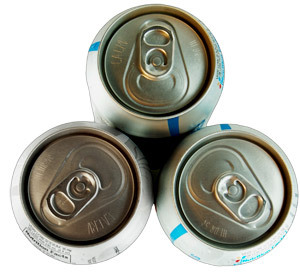 After about two minutes, take the cans out of the cold mixture and give them a quick rinse in plain tap water to keep the salty taste from creeping into your drink. Now you know how to chill coke really fast! A note for diet cola and other diet soda lovers: Aspartame (aka Nutrasweet) breaks down in heat — so if you leave it in the car, in the garage, or anywhere else that will heat it past 85 degrees or so for any length of time, you will be left with a really gross drink that won’t even taste okay chilled. This would count for Diet Coke, Diet Pepsi, Diet Mountain Dew, Sprite Free, etc. Sodas with Splenda as the only sweetener — such as Diet Rite — shouldn’t have this problem, however.